Are you compelled to tell your side of the story? Do you fight thoughts of suspicion or distrust? Are you constantly rehearsing past hurts? Have you lost hope because of what someone did to you? 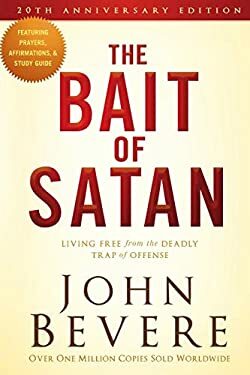 The Bait of Satan exposes one of the most deceptive snares Satan uses to get believers out of the will of God--offense. This trap restrains countless Christians, severs relationships, and widens the gulfs between us. Jesus said, "It is impossible that no offenses should come" (Luke 17:1). Although you will encounter offense, you can choose how you will react. In this new twentieth anniversary edition, John Bevere shows you how to identify the traps ahead of you and escape the victim mentality. With declaration-style prayers and testimonials from people whose lives have been changed by his message, this book will inspire you to stay free from offense and its destructive power. Don't let anyone affect your relationship with God!